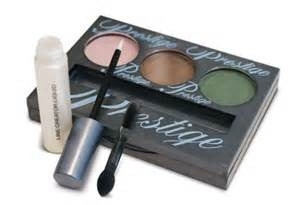 Prestige Color Creation Eyeshadow and Line Creator Kit. Turn any shadow into a liner Sweep the Line Creator Liquid applicator in a circular motion onto the shadow, and apply like a liquid liner. Details provided by Prestige. 0.21 fl oz/ 6 mL (Eyeshadow); 0.1 fl oz/ 3 mL (Liquid). Comes in colors: TRN-01 Mermaid.